These Fudgy Chocolate Brownies use a whooping three quarters of a pound (340 grams) of semi sweet chocolate which makes an amazing brownie. They are rich and oh so chocolately, yet their texture is quite light and chewy. I call them "Fudgy" Chocolate Brownies because their taste is almost like eating fudge. Although this recipe does not call for nuts, if you want a little crunch then fold in 1/2 cup (50 grams) of chopped walnuts, pecans, almonds, or hazelnuts. Or another idea would be to add 1/2 cup (80 grams) of dark or white chocolate chips if you want even more chocolate flavor. This recipe makes about 16 large brownies. If you like you can make a larger batch by simply doubling the recipe and using a 9 x 13 inch (23 x 33 cm) pan. Now, these brownies are baked in a moderate oven until a toothpick inserted in the center comes out with lots of moist crumbs. The brownies will also be just starting to pull away from the sides of the pan. Do not over bake or the brownies will be too dry. Under baking is better than over baking with these brownies because we want these brownies to be nice and soft. I love how the top crust of the brownies will be dry and cracked, yet underneath they will be wonderfully soft and moist. The day the brownies are baked, the chocolate flavor will be quite sharp. I much prefer them after a day when the chocolate flavor has mellowed. When choosing a semi sweet chocolate, always pick one that you enjoy eating out-of-hand. A good quality chocolate has a lovely shiny finish (a sign that the chocolate was cooked at the right temperature for the right amount of time) and a wonderful 'snap' when you break it into pieces. For these brownies I like to use a semi sweet chocolate with a 55% cocao content. In a pinch, you could use 2 cups (340 grams) semi sweet chocolate chips. 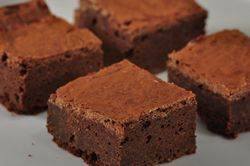 Fudgy Chocolate Brownies: Preheat your oven to 350 degrees F (180 degrees C). Butter (or spray with a nonstick cooking spray) an 8 inch square (20 cm) baking pan. Then line the bottom of the pan with parchment paper.